One of the most universally loved British foodie pastimes is Afternoon Tea. As a global citizen myself, I know just how much my family and friends from abroad love indulging in an Afternoon Tea whenever they visit Britain, and there is such an amazing choice available, ranging from the classic quintessential British Afternoon Tea, to themed or seasonal ones, which are gaining in popularity. Afternoon Teas are the perfect way to spend an afternoon, whether its a date, a treat with the family, a hen party, a birthday or special occasion or even a just because. The sheer excitement of the Afternoon Tea stand being placed on the table and eyeing up all the different tiers makes me giddy! I personally love devouring the savouries first, then the scones and finishing off on a sweet note with the pastries. As I am a food and travel blogger, I absolutely love experiencing different cuisines with global flavours when abroad and food is always the highlight of my travels and what I reminisce about the most. 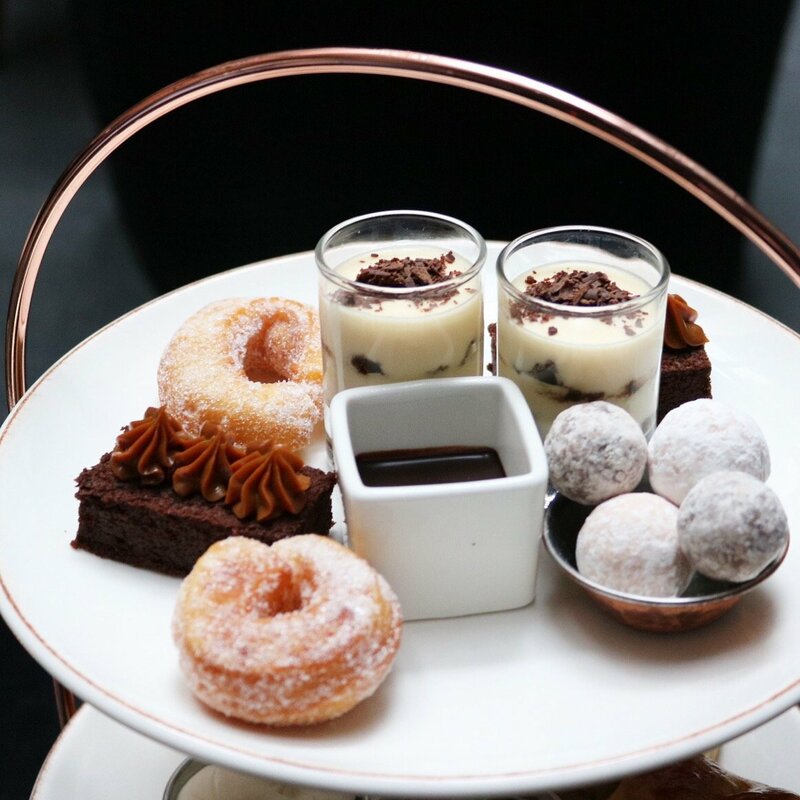 When I was invited to an event in collaboration with Lastminute.com called Taste of Travel at the 5* Mayfair hotel to try three different Afternoon Tea selections with an International Twist I was excited to tour the world through dishes. It happened to be a gorgeous summery day and so Moët & Chandon Ice Imperial was a very welcome refreshment. I had never had Champagne with ice cubes in before and it was a winner and I think I will be stocking up on the Moët & Chandon Ice Imperials at the first chance I get. There was also a great selection of cocktails such as Pisco Sours and Sangrias, which were delicious enough to put anyone in a holiday mood. Paired with the chilled Moët & Chandon Ice Imperial were some bespoke dishes, which are available at a fabulous venue in the West End called At The Hampshire Lounge Bar. The menu is called Le Thé du Soir and there were some amazing savoury and sweet dishes, which I was able to try, such as Steak tartare with a Moët & Chandon Ice Impérial-infused egg yolk, served with rye crisp Spiced crispy calamars frits with Moët & Chandon Ice Impérial mayonnaise and a refreshing Apple, pomegranate and pine nut smoked salad with Moët & Chandon Ice Impérial and a lime dressing. A selection of chocolate and vanilla and raisin and apple scones served with Cornish Clotted cream were heavenly, followed by a range of dainties such as English strawberry shortbread, Chocolat noir and roasted hazelnut cake, Almond macaron with raspberry and Moët & Chandon Ice Impérial ganache and a Blood orange and mousse au chocolat blanc. It was a very unique and luxurious stand full of treats and that champagne was fabulous. The second Afternoon Tea selection I tried was themed around the Mediterranean with flavours from Spain and Italy, which happen to be two of my favourite European cities. Available at The Mayfair Kitchen, the Signature Charbonell et Walker Afternoon Tea is a feast for the senses. There is nothing like a Trio of bruschetta to ignite wanderlust of romantic Italian cities, while feasting on Cherry Tomato, king crab with avocado and chilli and spinach and soft cheese delights. I absolutely love the simple yet punchy ingredients in Italian food and these bruschettas hit the spot. Sicilian Lemon Scones and Charbonnel et Walker Chocolate Scones served with homemade orange and nectarine preserve and vanilla mascarpone were perfect, soft and zesty. Scones for me are one of the most exciting parts of an Afternoon Tea and this was the first time I had tried a lemon flavoured scone and I have to say it has got to be my favourite flavours to date. It also reminds me of my time in Sicily where I had indulged in a Lemon dessert after a day trip to Mt Etna! Charbonnel et Walker has a special place in my heart for when I started dating my now husband, he would bring me a selection of their truffles every week (doesn’t happen anymore lol) and so the selection of Charbonnel et Walker Pink marc de Champagne, Dusted Milk Sea Salt Caramel Truffles and Dark Chocolate Crowns took me right down nostalgia lane. The sweet treats were exceptional with a selection such as Flourless Charbonnel et Walker chocolate and orange cake, Sugar coated doughnuts with Charbonnel et Walker Chocolate sauce (amazing!!) and a superb Tiramisu with Charbonnel et Walker Chocolate shavings on top for that extra touch. I adored this Afternoon Tea and would definitely indulge in it all over again in a heart beat! The final afternoon tea selection named El Dolce Semplice and available at Mayfair Kitchen and Monmouth Kitchen, takes you on an epic culinary journey through the Mediterranean and South America, namely Peru, with fabulous small plates paired with fine wines and signature cocktails. Quite similar to the previous selection, there is a Trio of Bruschetta with Parmigiana, Cherry tomato, spinach and soft cheese as well as a selection of tasty bite size Salmon and Jalapeno tacos for the savoury choices. Amaretto scones and Sicilian Lemon Scones allowed me to temporarily escape back to Italy whilst I spread that scrumptious orange and nectarine preserve all over the scones and and topped them with drizzles of vanilla mascarpone. The best way to end was with a selection such as a Flourless Charbonnel et Walker chocolate and orange cake, a Fresh fruit tartlet, the most incredible Churros with a dreamy Peruvian Chocolate Sauce and a very unique White peach and oregano panna cotta with the perfect wobble. This was an incredible way to Taste the World through continental twists to the traditional British Afternoon Tea. It took my taste buds on a journey, experiencing flavours of the world and I thoroughly enjoyed this indulgent voyage. All three were extraordinary Afternoon Teas and so if you are looking for a different and unique Afternoon Tea, any of these would be superb. My personal favourite was the El Dolce Semplice and the Sicilian Lemon Scones are the best scones I have ever eaten to date at any Afternoon Tea. The Moët and Chandon Ice Imperial was also fantastic for summer! The Lastminute.com website is an amazing resource, not only just for holiday inspiration and booking trips, which I regularly use it for, but also for finding Afternoon Teas whether you are after a classic Afternoon Tea or a novel one. It is not only convenient but also has such an amazing range that you may not even have known was available! Get searching and booking! Disclaimer: This post is in collaboration with Lastminute.com but all views and opinions are my own. I can’t decide which of the scones I want to eat first (because I am all about the sweet things) – apple and raisin or the amaretto ones, they both sound heavenly. Yum! Such a good afternoon tea! (and lovely to see you!) The Charbonnel et Walker scones and Salmon and Jalapeno tacos were definitely my faves!